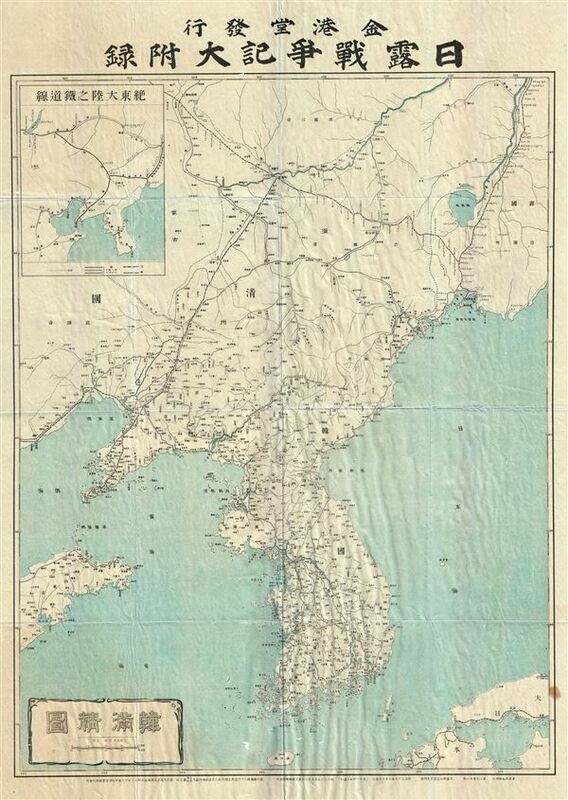 This is an unusual and appealing large format map of Korea (Corea) and Manchuria dating to 1904 or Meiji 37. This map, made in the 37th year of the Emperor Meiji's reign, covers all of peninsular Korea (Corea) and Manchuria in the northeastern part of China. The map includes an inset of the region in the upper left quadrant. This map was issued during the Russo-Japanese War which lasted from February 1904 to September 1905. The war was fought between Imperial Japan and Tsarist Russia over control of Manchuria and Korea. Russia sought control of the region in order to gain access to the warm water port of the Pacific. The war resulted in a string of embarrassing defeats for Russia, leading to a general distaste for the Tsarist regime. Some believe that the negative sentiment towards the Tsar established during this campaign was a strong influence in the upcoming Bolshevik Revolution. The map notes several important towns, rivers, roads and other topography. All text is in Japanese. Very good. Minor wear along original fold lines. Minor worm holes at a few places.